Make the chicken. In a large saucepan, place chicken, water, garlic, jalapeño, bay leaf, salt, peppercorns, mustard seeds, and thyme. Bring to a boil, then cover and simmer on low, 15-20 minutes. Turn off the heat and let the chicken relax in its spa, covered, for 20-25 minutes. Remove the chicken from the water and shred with two forks, then toss with hot sauce. 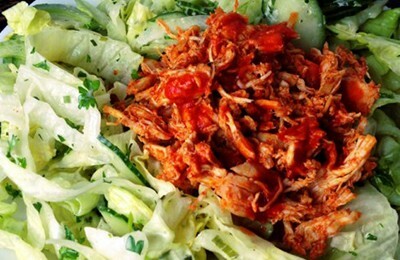 You can also use leftover chicken from our Shredded Buffalo Chicken under Slow Cooker Recipes! Make the salad. In a large bowl, toss the salad ingredients with the dressing using two wooden spoons. Think of it as a mini cardio workout and toss for about two minutes so all the vegetables are coated with dressing. Top with shredded chicken and enjoy!